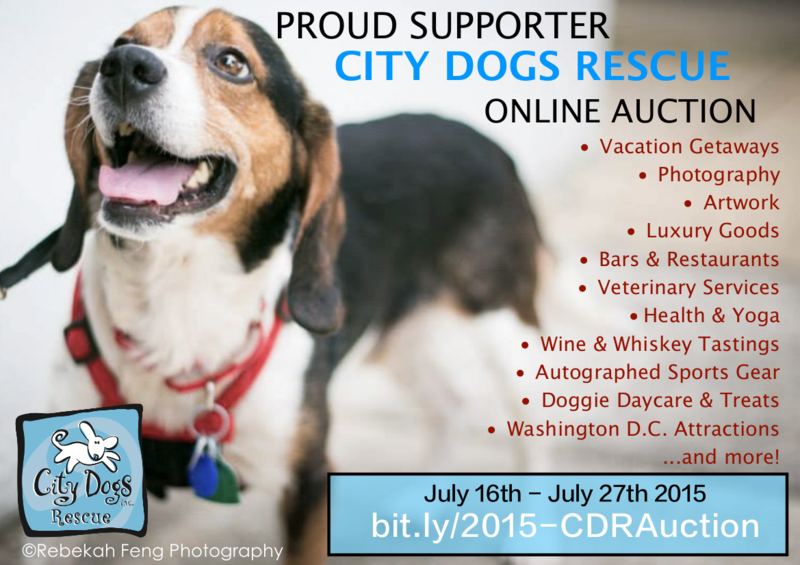 9pm Studios is proud to have the opportunity to support the City Dogs Rescue DC Annual Online Auction this year. Read a Washington Post story about their strong social media presence. The auction is live through July 27, 2015, and you can visit it by clicking here: City Dogs Rescue: Summer Auction 2015. The gift certificate donated by 9pm Studios is here: Web Development, Design & Marketing. Other items, events, and services that are available for bidding, include West Elm, Tiffany, Room & Board, The Jefferson Hotel, Embassy of Lichtenstein, Le Diplomate, Ipad Mini, National Theatre, Blue Planet Scuba, NBC4, Ezra Klein & Annie Lowrey, Ritz-Carlton, Allen Edmonds, Washington Capitals signed pucks, Vida Fitness, Studio Theatre, EatWell DC, Nellie’s, National Symphony Orchestra, City Dogs Daycare, multiple vet packages, and many more!